- NEW ADDITIONAL DYNATUNE "PRO" SUSPENSION DESIGN MODULE. - NEW ADDITIONAL DYNATUNE "EXPERT" SUSPENSION DESIGN MODULE. - NEW ADDITiONAL DYNATUNE "RACE" RIDE & HANDLING SETUP TOOL. CPU TIME OPTIMIZED VARIANT OF "EXPERT" VERSION FOCUSED PURELY ON HANDLING TESTS & LAP TIME SIMULATION. With the arrival of these 3 latest additional Software Variants for DYNATUNE 7.1 and the 3 exiting standalone tools BDM, DDM & STM the Product Portfolio of the Software has closed a 360° development loop. Both the RIDE & HANDLING Tool as the SUSPENSION DESIGN MODULE are available in "BASE", "PRO", "RACE" and "EXPERT" Version, each with specific tools and features that are tailor made for the intended customers and their skill level. Adding the concept of "Link Stiffness" into the "PRO" and "EXPERT" Suspension Design Module allows to investigate what effects (bushing-) stiffness has on suspension deformation, changing kinematic suspension characteristics by load application at the wheel. Furthermore the possibility of looking into specific (combined) load cases provides an excellent tool to effectively analyze and design a GEOMETRY, COMPLIANCE & LOAD CHARACTERISTICS of a suspension system without having to revert to hugely complex and costly multi-body-systems analysis tools. Adding the "RACE" Variant in the DYNATUNE RIDE & HANDLING will help typical racing customers to focus on those tests that are of their primary interest without needing to understand all the extra information of the more scientific tests that are available in the "EXPERT" Version. Eliminating some of those tests has improved - in the spirit of racing - the CPU time, making Performance Envelope & Lap Time calculation up to 20% faster and more efficient. The 3 standalone tools for longitudinal dynamics and in-detail suspension tuning have filled in the gaps that many clients were asking for. I hope that all of them do help you make your cars go better & faster ! Best Regards & Thank you for your continuing enthusiasm for the tools ! 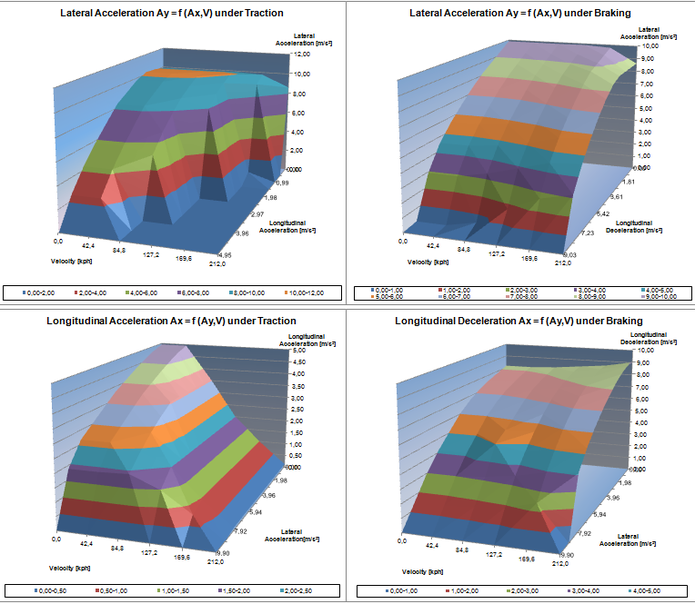 2D QUASI-STATIC LAPTIME SIMULATION WITH CONTROL PANEL AND SECTION DATA PRESENTATION. UNDERSTEER/OVERSTEER LIMITS INCLUDED IN LAPTIME CALCULATION. TEST-TRACK & CIRCUIT LAYOUT SHEET. COMES WITH 3 STANDARD TRACKS. BUILD YOUR OWN TEST TRACK. PERFORMANCE ENVELOPES FOR COMBINED LATERAL & LONGITUDINAL ACCELERATIONS. BOTH FOR LINEAR AS FOR NON-LINEAR CALCULATIONS. THREE DIMENSIONAL UNDERSTEER GRADIENT & SIDE SLIP ANGLE GRADIENT CALCULATION & GRAPHIC PRESENTATION. PERFORMANCE ENVELOPE SUPPORT POINTS CUSTOMIZABLE FOR BEST FIT RESULTS. ADDED TIRE LIFT & DRAG COEFFICIENTS FOR MORE ACCURATE OPEN WHEEL VEHICLE AERODYNAMICS. 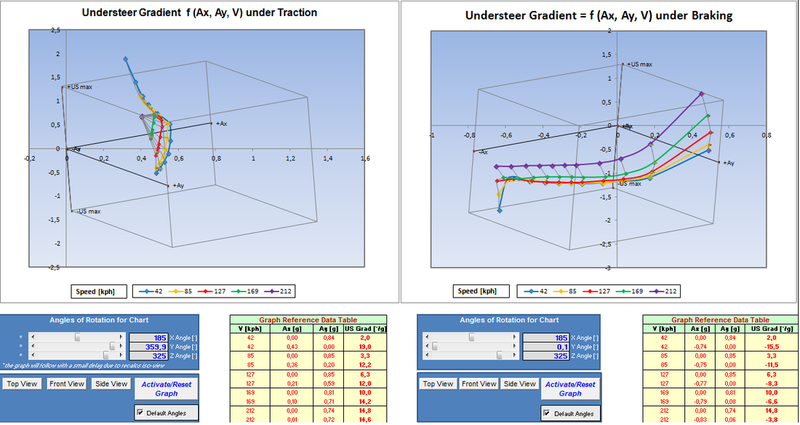 ENHANCED TIRE MODEL THAT CONVERTS THE PARTIALLY LINEARIZED BASIC TIRE MODEL DATA INTO A MULTIDIMENSIONAL FULL NON-LINEAR LOOK-UP TABLE FOR TIRE SLIP ANGLE / LATERAL FORCE AS FUNCTION OF VERTICAL FORCE. 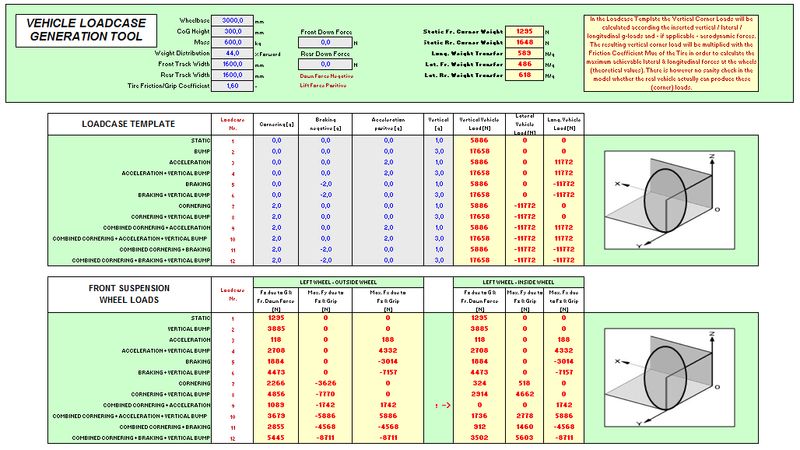 TIRE DATA KNOWLEDGE BASE ALLOWING TO CREATE MAIN TIRE INPUT PARAMETERS FOR BASIC DYNATUNE TIRE MODEL (DATA SUGGESTED BASED ON THE MAIN DIMENSIONS OF THE TIRES). PLOTTING FEATURES OF TIRE DATA ALLOWING TO VISUALIZE & CREATE YOUR OWN TIRE. DYNATUNE 7.0 represents with the "EXPERT" Level a state of the art vehicle dynamics tool in EXCEL ® that provides an ALL-IN-ONE solution to the customer for doing a complete investigation of the Ride & Handling Characteristics of his vehicle. 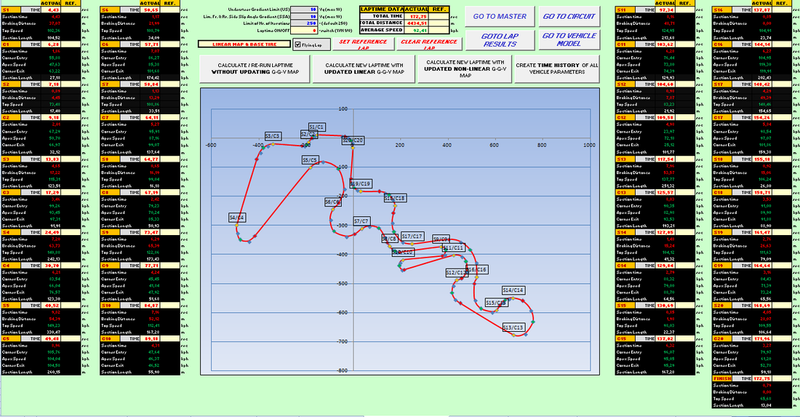 Through adding in the "PRO" & "EXPERT" Level the PERFORMANCE ENVELOPES feature, DYNATUNE 7.0 provides in the "EXPERT" Version with LAPTIME SIMULATION now several state of the art tools to make trade-off studies even more detailed and complete. Not only Objective Test Procedures can be used as judging criteria, but also comparisons on a real test/race track can now be taken into consideration for judging the final quality of the vehicle setup. 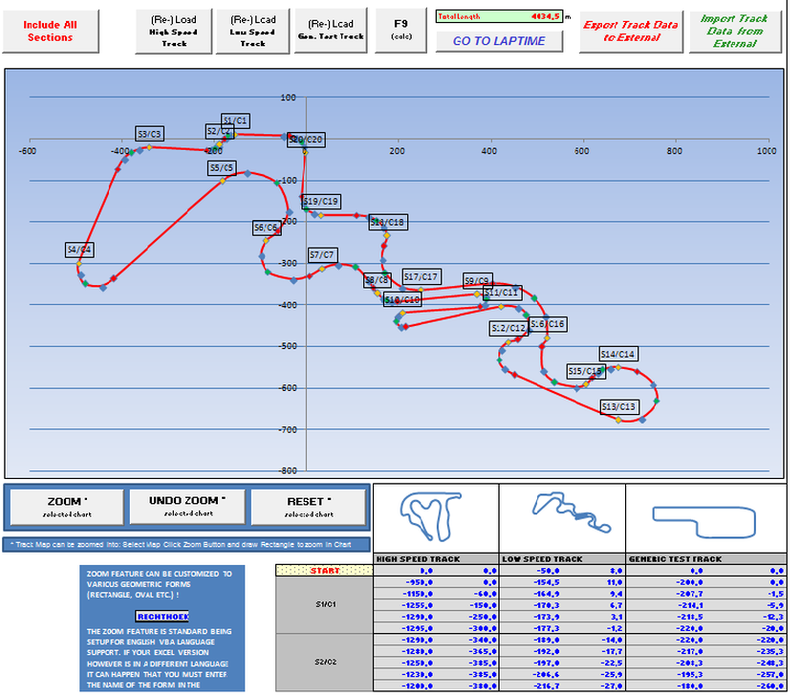 For each point on the track the state of the vehicle can be analyzed. If wanted, any objective metrics can be calculated for any data point on the test-track. Adding additional USER TOOLS will make especially the life of "novices" a lot easier. For many of the suspension and tire data now exists a reference database which will allow to select from commonly used references number the correct value for your parameter. All of these features remain true to the original concept of being "only as complex as necessary" and must strictly remain applicable in the familiar MS EXCEL ® environment, permitting the customer to concentrate on dynamics and not on learning how to to drive the software. The "EXPERT" Level has also demonstrated to have arrived at the boundaries of the capabilities of MS EXCEL ®. Due to the complexity of various algorithms and the amount of data to be handled an i5/i7 multi-core processor (or similar) is highly recommended for those who plan to run frequent laptime simulations.